I adore Colin Firth. In fact, I like to think of him as my former future husband. He’s tall, elegant, witty, snarky, and of course there is the whole Mr. Darcy thing. So can I understand a woman’s obsession with him? Yes. Yes, I can. Boothbay Harbor, Maine, is about to get a whole lot more exciting, because Colin Firth is coming to town to film a movie. His arrival will impact three women in particular: Gemma, Bea, and Veronica. Gemma lives in New York City, is in her twenties, and married. She adores her husband, even if she feels as if they are becoming estranged. When they got married, they had the same goals, the same ideals. They wanted the city life, were ambivalent about a timetable for having children, wanted to pursue their careers. But her husband wants to speed up their “somedays” and make them today. He wants a house in the suburb and children, and he wants Gemma to tone down her career. The latter appears to happen when she loses her job, but Gemma does not capitulate quite so readily. When the opportunity comes to visit a friend in Boothbay Harbor, she takes it, and her visit becomes an extended one when she lands a freelance job writing about a local home for unwed pregnant women. Shortly after her mother dies, Bea receives a letter from her. The contents are a bombshell: the people Bea knew as her parents are not, in fact, biologically connected to her. They adopted her as an infant. Bea becomes curious; who is her birth mother? Who are her biological parents? She discovers that her birth mother was once in a home for unwed pregnant girls up in Boothbay Harbor, so she heads north to investigate her background. Having given up her daughter for adoption after a surprise teenage pregnancy, Veronica found herself without a clear path. She dabbled in cooking and moved around to different states. Now she’s back in Boothbay, hoping to meet her daughter some day, and still feeling unsettled. She can’t seem to have a lasting relationship with any man other than Colin Firth, whose movies provide a salve to her struggles. Obviously, these three women will connect, with that Colin Firth production in the background. This is a sweet story. In fact, that’s the best word to describe it: sweet. The three women are not perfect; they make mistakes, they mishandle situations, and they can’t seem to find a way to be happy. We like them, though, because of those flaws, and we cheer them toward the happiness they deserve. 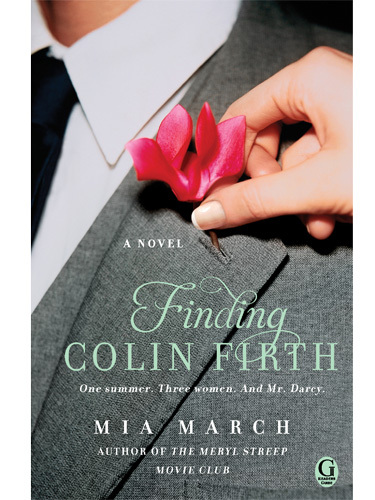 If Colin Firth can help, all the better. This is the second in a series – The Meryl Streep Movie Club came first – but you don’t need to have read the first installment. I didn’t, and I had no trouble picking up the story lines in this book. As someone who was adopted, I found Bea and Veronica’s stories the most compelling, but I think any working woman will relate to Gemma. They are three very likable characters, fully written and rounded. The same can’t be said for some of the other characters, and there are times the pacing slows down. Still, though, it’s a pleasant read.